If you’re seeking a charming, upbeat and walkable neighborhood then living in Virginia-Highland might just be perfect for you! Also known as “The Highlands” and “Virginia Highlands,” the neighborhood is an Atlanta favorite. It’s very well known for its quaint bungalows and other historic homes. Plus a pleasant restaurant and shopping scene. The neighborhood is a popular destination for people throughout the greater Atlanta area. With its eclectic mix of high-end boutiques, well-regarded restaurants and happening bars serving as the magnet. Explore Virginia-Highland real estate listings below or read more about living in Virginia-Highland. When you need a Virginia-Highland real estate agent to buy or sell, talk with us. We’re neighborhood experts and here to help you! 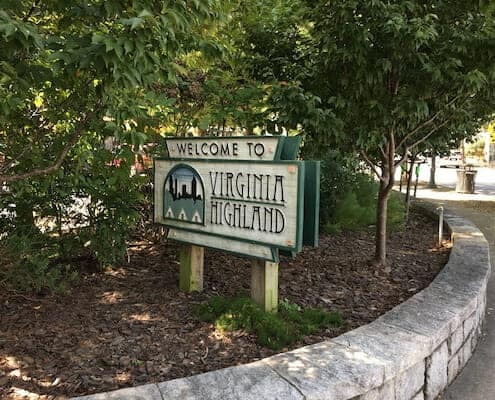 The first thing most residents like about living in Virginia-Highland is it’s location. Virginia-Highland is conveniently located adjacent to the Atlanta Beltline. A biking and walking trail which runs from Piedmont Park to Inman Park and beyond. Virginia-Highland residents enjoy a premier location along the BeltLine and Piedmont Park. The huge redevelopment of Ponce City Market has brought even more interesting and convenient shops and restaurants to the area. For example, Whole Foods and Trader Joe’s. Here are the top 10 reasons to love Intown Atlanta living. The neighborhood is bound on the north by Amsterdam Avenue and the neighborhood of Morningside. On the east by the Atlanta city limit / Briarcliff Road and the Druid Hills neighborhood. On the south by Ponce de Leon Avenue and the Poncey-Highland neighborhood. 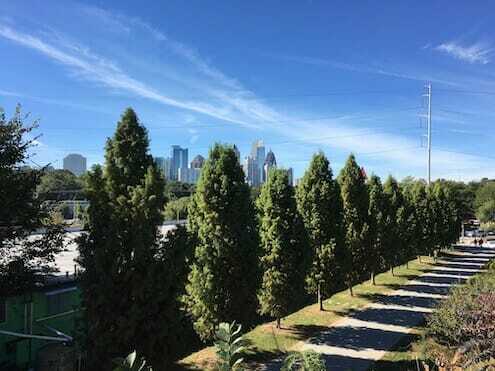 And on the west by the Beltline which is the border with Piedmont Park and Midtown. Day-to-day life in Virginia-Highland is superb. It’s one of the best Atlanta neighborhoods for cycling and one of the best walkable Atlanta neighborhoods. Plus it’s a super dog-friendly Atlanta neighborhood. Virginia-Highland is also well-known for its the annual Tour of Homes and Summerfest. Both have become some of the city’s most enjoyed events. There’s always something good happening in Virginia-Highland. Founded in the early 1900’s as a suburb of Atlanta, Virginia-Highland was accessible by a streetcar until 1947. At this time, most of the streetcar / trolley lines in Atlanta were discontinued. It’s named for the intersection of Virginia Avenue and North Highland Avenue. The center of a busy little commercial area that’s the heart of the neighborhood. Like most Intown Atlanta neighborhoods, Virginia-Highland real estate suffered serious decline in the 1960 and 1970s. At that time, residents moved to Atlanta’s suburbs. Many single-family homes were turned into apartments and deteriorated. Crime in the neighborhood increased. Some businesses closed. Some were replaced by low-rent tenants. A few remained. Specifically, Atkins Park Restaurant and Moe’s and Joe’s stayed open. Both establishments are popular neighborhood landmarks today. In the early 1970’s the Georgia Department of Transportation threatened to build a highway through Virginia-Highland. And the future of Virginia-Highland real estate values was in doubt. But a strange but wonderful thing happened. A group of neighbors got together and decided to fight back. And they prevailed! Preventing their down and out little neighborhood from being wiped off the map by the highway. After it became clear the highway was not going to be built, people began to buy old homes. They fix them up and steadily the prices for Virginia-Highland homes for sale began to rise. Developers started to lease renovated commercial buildings “as is” at low rates. They encouraged new and unique businesses. And a truly distinct commercial district emerged. Today Virginia-Highland homes for sale are more pricey than ever. That’s to be expected as the neighborhood truly has it all. People have absolutely loved living in Virginia-Highland for over thirty years. As such, Virginia-Highland homes for sale today come with substantial price tags. This is due to the convenient location, parks, charming homes and of course the thriving commercial areas with their boutiques and fine restaurants. We encourage you to take the time to explore Virginia-Highland real estate and see why people love it here. If you’re thinking of buying or selling a Virginia-Highland home and need a highly experienced Virginia-Highland real estate agent talk with us, we’re ready to help you.